BAR HARBOR — Nearly 500 volunteers are expected here on Saturday, Nov. 3, to assist in putting the park’s historic carriage roads to bed for the winter. 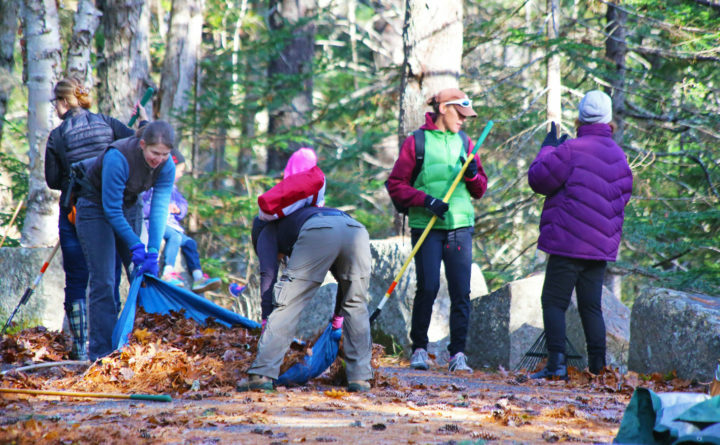 Take Pride in Acadia Day attracts hundreds of enthusiastic volunteers of all ages to rake leaves and clear drainage ditches along miles of carriage roads in preparation for the cold weather. The well-coordinated volunteer effort, now in its 27th year, focuses on areas where clogged drainage ditches and culverts could result in significant damage to road surfaces during the freeze-and-thaw cycles of a coastal Maine winter. The event begins at Park Headquarters on the Eagle Lake Road in Bar Harbor at 8 a.m. and runs until noon. Volunteers should dress for the weather and in outdoor work clothes. Tools and gloves are provided. Because of the size of this event, registration is required. Only groups that register together can be assigned to the same work site. Up to 10 individuals can register together online at www. http://friendsofacadia.org/events/take- pride-in-acadia-day/; larger groups should contact Dana Petersen at dana@friendsofacadia.org or 207-288-3934. This event typically fills to capacity, so advance registration ends Oct. 26. EverGreen Home and Hearth, Fiore Artisan Olive Oils & Vinegars, First National Bank, Gallery at Somes Sound, Galyn’s, John Williams Boat Company, The Knowles Company, The Lynam Agencies, Machias Savings Bank, MDI Hospital, Pedego Acadia, VHB, Window Panes, and Witham Family Limited Partnership.